The most prestigious upcoming film in Tollywood. Vyjayanthi Movies and Swapna are jointly released. Keerthi Suresh is playing the role of Savitri. The film is directed by Nag Ashwin and Priyanka Dutt is the producer. The film is going to be released soon after the release of the post production works tomorrow (April 14) with the movie "Mahanati" motion poster. Samantha, already released, had a good response to Vijay Devarakonda's first looks and motion poster. 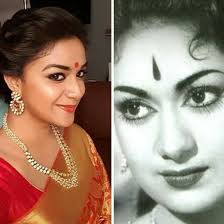 "Mahanati" is the screening film based on Savitri's life which is screened as Periodic Biopic. Director Naga Ashwin has made this film technically with high standards. Mohan Babu as SV Ranga Rao a special attraction for screen premieres. Mahanati movie singer: mikki j.mayor, production design: shivam, art: avinash, costumes: gaurang, archana, stylist: indrakshi, camera: dani, art leadership: tota taruni, editor: kotagiri venkateshwar rao, direction: naga ashwin, producer:priyanka dutt.